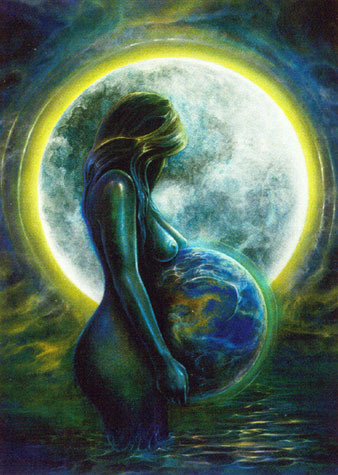 Female spirituality is an acknowledgement of the Goddess as planet, as the earth and as woman. In short, this is the female principle of creation that is uniquely female. 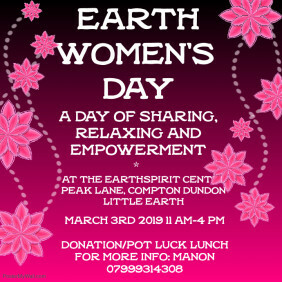 Women can create life, they celebrate life and honor her through their participation in the cycle of the earth and the universe. They represent Life! The Goddess is everything that is creative, everything what lives in nature and everything what it truly means to be a woman: love and growth. The Goddess is visible in the wheel of birth, growing up, dying and reincarnation. She is felt in the changes of the seasons, the waxing, full, and waning moon, the tides, the rising and the setting sun. She is perceived in the joyful playing of children, the first menses, in falling in love, giving birth, being a mother and the menopause. She is the unending circle of creation, movement, growth and change that is celebrated by women and that is reflected in the transformations in the life of a woman. The Goddess gives everything and takes everything, she is the connection with life, the earth and the cosmic powers. Everything that influences the earth, influences the Goddess and everything and everyone on earth. A clean environment is good for us, just like harmony among people without competition, conflicts and separation. The Goddess is in all of us; she is the power and the strength of women, and men too, to directing their own lives, to having free choice and to taking responsibilities for their actions. The philosophy of the Goddess is, that there is abundance for everyone. For centuries women have been forced to play a certain role based on (unnatural) expectations of men of how a woman should behave. They had to hide (and still do) their true feminine divine selves and so it is no surprise that women of today have difficulties claiming back their divine feminine power. Women still experience the conditioning inside themselves of the values they were expected to live in daily life. Even now in many cultures (including the western cultures) the natural balance between men and women is still not there, although things are improving but it will still take some time. One can not expect to overturn centuries of conditioning in just a few years time. So how can we get back to that natural balance between men and women? How can women claim back their divine female selves? It starts with an awareness of who we truly are and how we can live our life’s purpose. The way of the Goddess can help us get connected to our divine self. She is a wonderful teacher and already part of us, she just needs to get acknowledged once again so we can become whole. Just take a good look at Mother Earth and the beauty of nature that has been created for us and you will feel the true spirit of creation. It is not only up to the women to bring back the peace and love into the world, that role is also for men to perform as they integrate the divine feminine into themselves as well. The values of Tender Loving Care and a more human approach are very much needed and this is where the divine feminine comes in: she is the flow of life that moves with the natural cycles and makes us create the beauty we need in this world. Just come out into nature and feel her power, you will know what to do.